One thing you will notice if you peruse my stash, my wardrobe, pretty much my home in general is that you will not find much in the way of pink. I blame my parents. Back in the early 1970’s, when they bought the house I grew up in, they painted my bedroom a shade slightly lighter than Pepto Bismol. And my bedspread and curtains? Were pink and white gingham trimmed with rick-rack. So very, very girlie. So very, very not me. 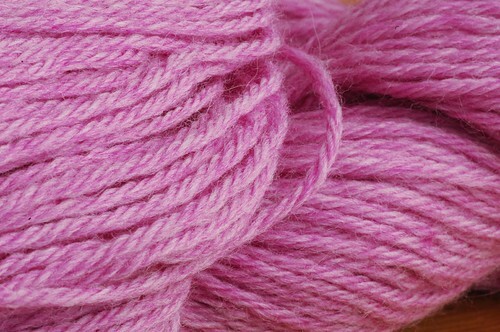 So how, you might ask, do I explain this week’s yarn pr0n? When I was in Charlotte and stopped by Rainy Day Yarns with Aimee, she was looking for yarn to make a really cute pair of cabled gloves. (“Winter Gem” – The pattern is in the Fall issue of Cast On magazine). I decided I wanted to make them too. Since my winter jacket has a pink lining, I decided to go for it – they should match! 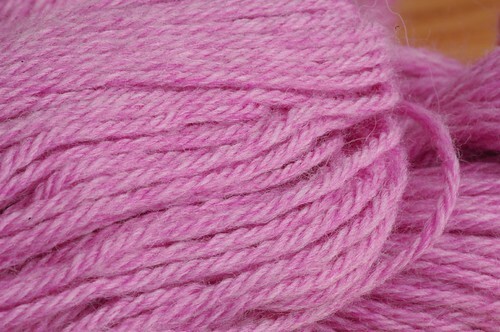 And I found this lovely heathered pink Cascade 220 that was an excellent match. Aimee grabbed another hank for me the next day when I decided I wanted to make a hat to match, too. Of course, at the rate I’m going, I’ll have it done in time for, oh, Winter of 2027? 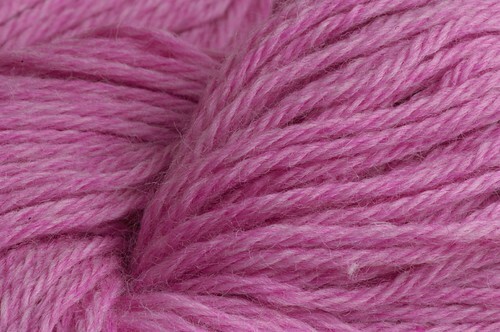 January 24th, 2008 | Tags: Knitting, Planned Projects, Yarn Pr0n | Category: Misc. Do you know what global warming is going to do to Winter 2027? Ha ha! Yeah I’m not a pink person either, but sometimes I cave. I don’t use much pink either! Though it was my favorite color for a long time when I was little. Now it’s gotta be hot pink (very rock and roll) if I’m gonna use it 😉 This is really pretty though, and I think it’ll look great on you! … in 2027. I notice Carrie posted on this pink thing! I’m not surprised since she has disliked pink for a long time. I think in certain shades it’s very flattering and this one is beautiful. It’ll look great on you and match you coat lining. Will you STILL be wearing that coat in 2027?!?! Wow, you keep your clothes a long time :)! I had the exact same thing happen to me when I was a kid. I wanted a blue bedroom when I was in 6th grade. My mom said what if they couldn’t get a blue rug so I said it didn’t matter what color as long as it wasn’t pinkl! So, what color room did I end up with?? PINK!!! Having been fed pepto a lot as a child (my mother’s cure-all for whatever stomach issue I had), I loathe that shade of pink. But the pink you chose is just right! So pretty and spring-like. Makes me wish winter was over already. I love that color. Still. And I love my gloves. you need yours. But then, my childhood bedroom was mustard yellow. 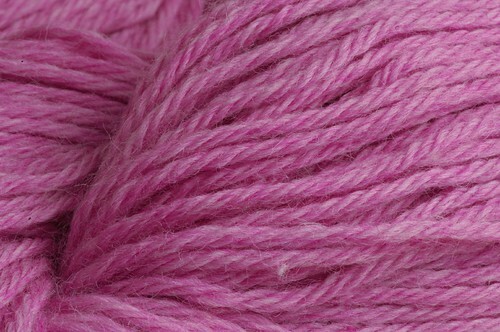 Not much a pink person either, but that’s some seriously pretty yarn. First Stariel, now you – Pink is taking over the world!!! bwaaaa haaaa haaaa!